Dr. Heinrich Zemo created deadly weapons for Germany during World War II, and his plotting led Captain America to be frozen for decades. He later formed the original Masters of Evil to defeat his old foe. 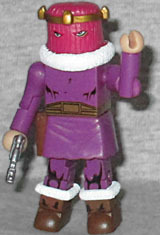 Zemo's looking pretty swanky in his purple robes. The skirt is a new piece, with a molded holster on the right hip, and there's 3D fur around the top of his boots. He has a dark golden belt painted on his torso, and his hood is a unique sculpt, with white fur and a golden crown, and eyeholes that line up very well with the face painted beneath. Yes, there's a face under there. And yes, Heinrich is the Zemo who permanently glued his mask on. Meaning that we shouldn't get to see a face, right? Right. But there's an excuse for that, and it involves this figure's variant (or more accurately, the figure for which this figure is a variant). The son of Heinrich Zemo, Helmut blamed Captain America for the death of his father, creating a new Masters of Evil and attacking Avengers Mansion. Under his mask, his face is horribly burned by Adhesive X. It's Baron Zemo II! He sticks with the family's chosen colorscheme of purple, pink, white and gold, though his costume is more modern. His boots and gloves are golden, and while he's still got rings of fur around his shins, he's also got poofy sleeves, fur on his shoulders, and a sleeker tiara. His belt is the same shape as his dad's, but with a simpler design. Both Zemoes are armed with a silver pistol, but this one gets a new sword, too. So about that head. Zemo I has a removable mask, though that's the direct antithesis of the character. Zemo II is the one with the melted face, but his toy doesn't have a removable mask. However, Helmet has, in the past, cosplayed as his dad, so you can pretend that's what the figure represents. 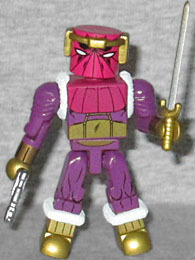 Alternately, because of the way Minimates are made, you can just put the burned head on Zemo II's shoulders and call it a win! 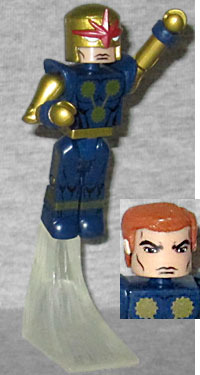 Marvel Minimates Series 50 had no theme other than "we haven't released these people yet," so both Zemos come with Nova Corps Centurions. The Nova Corps was originally the military and exploration force of Xandar. When Xandar was destroyed, the Corps expanded its scope, enlisting non-Xandarians and policing entire galaxies. The last Nova we reviewed was Sam Alexander, but this is Richard Rider. The packaging may not say it, but that's who it is. This is his classic costume, and the set includes a brown hair piece that looks like his. His costume is blue and gold (rather than the comics' blue and yellow), he gets angled shoulder pieces and a new helmet with a red star molded on the brow. The figure includes a flight stand, but more than that, he includes extra pieces. Since you're army-building this guy, having two Novae would be pointless if it was always Richard Rider. So not only does the set include his brown hair, it also includes a different piece of black hair, and a second head with blue skin and a red mohawk! Since the Nova Corps is basically Marvel's version of the Green Lantern Corps, having random aliens in the suit works for them! If you don't mind pink ears on a blue head, you can swap the hair around however you like. This entry was posted in Art Asylum, Marvel, MMMR and tagged Captain America, Guardians of the Galaxy, Minimates. Bookmark the permalink.